Fluid on the elbow is a condition known as elbow bursitis or olecranon bursitis (or sometimes "popeye elbow"). The bursa is a lubricated sac located between the tip or bend of the elbow and the overlying skin. It helps reduce the friction between bones and skin, muscles or tendons during movement. Injury or infection can cause the bursa to become irritated, inflamed and filled with fluid or pus, leading to a number of bothersome symptoms. According to the American Academy of Orthopedic Surgeons, swelling is often one of the first symptoms of fluid on the elbow, or olecranon bursitis. Acute or chronic irritation or infection can cause fluid to increase inside of the bursa sac. As this happens, it causes swelling on the back of the elbow. Because of the folds of loose skin on the back of the elbow, swelling may go unnoticed for some time. As the fluid builds up, the inflammation increases and may appear as a "goose egg" over the tip of the elbow bone. In some cases, the bursa can grow so large that it restricts full movement of the elbow. Chronic inflammation caused by repeated injury or recurring infections can lead to the thickening of the folds of tissue of the bursa. The thick tissue can sometimes be felt beneath the skin; it may feel like nodules or small lumps, or as if there is something floating around in the area. Some people may develop inflammation on the back of the elbow that causes no pain; however, others may experience slight to severe pain at the tip of the elbow. The elbow can become so tender that it is difficult to put it down on a table or other surface. 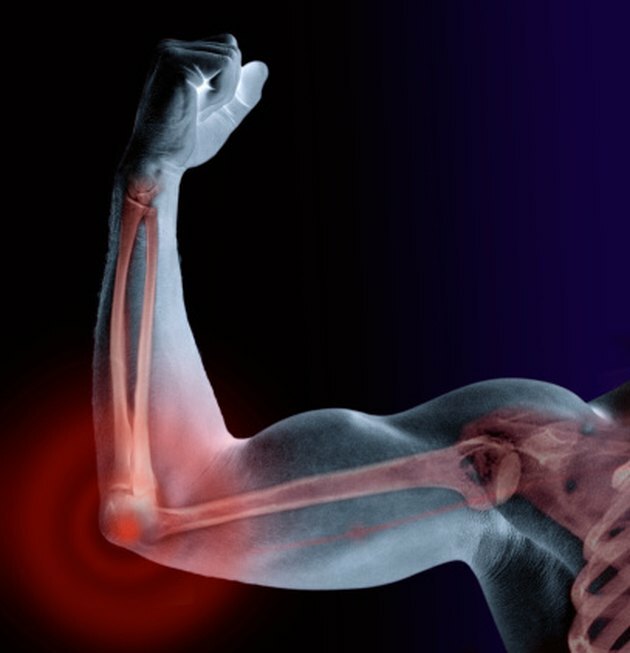 Extending or retracting the elbow may be especially painful. Infection caused by injury to the elbow or by a superficial skin infection that spreads down to the olecranon bursa can lead to more serious symptoms that affect the whole body. An abscess (pus-filled lesion) may form on the elbow, and the bursa can fill with pus instead of fluid. The area around the elbow may become red, streaked, hot and very tender to the touch. As the body tries to fight off the infection, the person may also develop a fever and chills. Without prompt treatment, the abscess can start to drain and seep pus. The infection may spread to other parts of the arm or body, so people who experience any signs of infection should seek prompt treatment to avoid serious complications. What Are the Causes of Bilateral Elbow Pain?